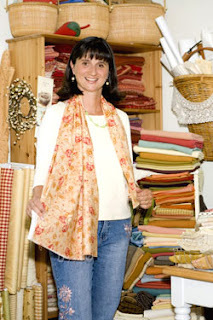 Joanna Figueroa is the visionary behind Fig Tree Quilts, and today she talks to us about her design process and her romantic Allspice Tapestry collection. Where do you get your ideas for your fabric designs? I definitely have lots of favorite places that I go to for color inspiration - special spots like flower shops, dress boutiques, flea markets, stationery stores, even my favorite bookstores sometimes yield great color combinations that end up being the inspiration for a new line. I always start with the color palette first. After I have fallen in love with the way that the colors feel together, I begin to work on the prints. I don’t use all one medium and all one style - my designs can be hand drawn, painted, computer manipulated, derived from vintage fabric swatches, etc. I am always looking to make and use color combinations that are just a little bit different & unexpected, vintage but with a fresh appeal. That’s why we call our style Fresh Vintage™. Tell us a little about the Allspice Tapestry collection. What inspired it? The Allspice Tapestry line started with one old cinnamon floral swatch that was an all time favorite, very elegant and vintage feeling. It wasn’t hard to match all of the colors and accents to that original cinnamon floral combination - there were so many beautiful, soft colors that complimented it so well -- well-worn aqua, warm pink, soft cream, sage green, deep caramel, faded red. Many of the other colors in the line add color combinations that catch people’s interest that you might not expect to see. To hear that from people is one of my favorite compliments to receive. What are a few things about yourself that you wouldn’t mind telling us? I love to watch old 80s shows. I am a nut for dark chocolate mixed with orange in any way. My favorite thing to work on these days is my Fresh Vintage™ pubication. It comes out quarterly and lots of people eagerly await each new issue. I never know what each issue will contain until I actually sit down to produce it. It’s really fun for me to see each one evolve. Can you give us a glimpse into future collections? Currently I am working on swatches of my new line which will debut at Quilt Market in Houston. It is a fresh, Spring collection called “Dandelion Girl”. The palette is soft creams, warm peach, aqua, apple green, faded cinnamon brown and a butter yellow. It has soft florals and a bunch of little prints and mosaics. Oh… and there are some wonderful woven stripes and plaids with it. And seersucker! And some finished product goodies that you’ll just have to wait and see at Market...tease, tease. Actually, I don’t even know how those are going to turn out yet.